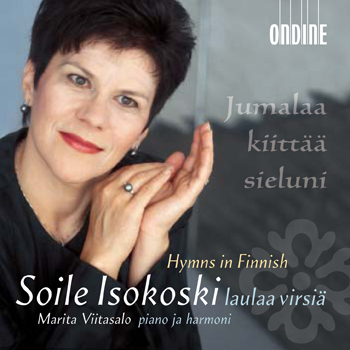 This CD features star soprano Soile Isokoski and her long-time accompanist Marita Viitasalo with an anthology from the Finnish hymn book. Recorded by the Finnish Broadcasting Company (YLE) between 2002-04, this selection of twenty hymns forms the first volume to "Hymns in Finnish. Soile Isokoski laulaa virsiä". Track nos. 3-5, 7 and 8 feature Marita Viitasalo on reed organ.